It’s not often that a European metropolis that is hundreds of years old has the opportunity to create a massive new public park directly in its city center. 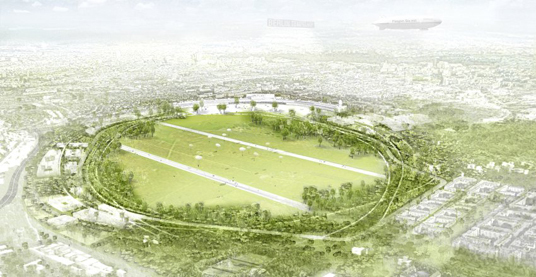 But that is exactly what the German capital of Berlin intends to do with the former Tempelhof airport, which was closed in October 2008. In the nearly two years since the runway went silent and the enormous terminal was shuttered, the stream of proposals for transforming the field into a public space have illustrated the riches of this city’s creative class. They have ranged from the sublime to the ridiculous. Some wanted to turn what was the world’s first passenger airport, which first opened as a simple booth in 1923, into a gigantic red-light district. Others suggested a luxury health and wellness center for the rich and famous, complete with landing strips for private jets. Among the more imaginative, albeit improbable sounding, were proposals to plop a 1,000 meter (3,280 feet) high, Matterhorn-like mountain on top of the former airport or, more recently, to build a lake containing 10 million cubic liters of water, Less spectacular suggestions involve apartment blocks, public parks and sports grounds. 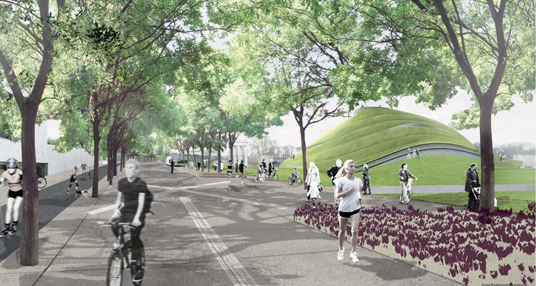 Many of the proposals were intended as exercises in creativity and were not included in the official city competition. Nevertheless, they still made popular fodder for sharing and discussions on Facebook and other social networks. On Friday, the city announced the finalists in the official competition, bringing Berlin one step closer to the final design of the massive new park. 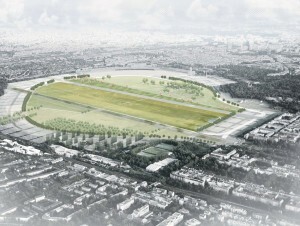 Although less lavish than some of the previous ideas, they are the most realistic ideas for Tempelhof’s future to date. Six finalists have been selected by the city, narrowed down from an original 78 entries. Most of the plans that have made the final round of the competition utilize the existing layout of the airport — one of the pre-conditions for the landscape designers was that they retain the runways and other historical features, including the terminal — but they also include interesting ideas such as a garden orchard and a small hill with a winding circular path. The general public will get a chance to debate the plans and the finalists will also be given a chance to refine their work before the final judging in December 2010. Interestingly, though, the plan that seems to be getting the most attention in the German press currently is one that doesn’t even number among the six finalists: It is one that two Berliners, Martin Brosch and Sybe Izaak Rispens, came up with, to turn the whole area into a large lake.